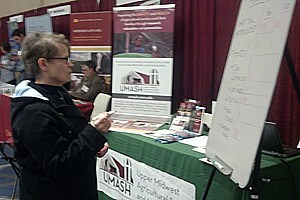 UMASH exhibited at the annual meeting of the Minnesota Farm Bureau on November 18, 2016. It was a great opportunity to network with others in agriculture and to share our resources with people across the state. We were interested in learning more about the attendees’ knowledge and participation in agritourism and found that nearly all we asked had visited a site which included a pumpkin patch, corn or sunflower maze, petting zoo and hay rides. Our efforts in agritourism are to help build awareness to this industry and to protect the owner and visitors on the farm by implementing sound safety practices.